Dr. Griffing believes that the best treatment is administered through mutual understanding and clear communication. He gives special attention to the patient’s dental needs and desires, building a treatment plan around each individual. Through the exploration and discussion of different options he guides his patients to the most healthy and beautiful smile. Dr. Griffing welcomes you to his practice as a patient and as a friend. He welcomes questions and wants to help you keep your teeth in their optimum health. 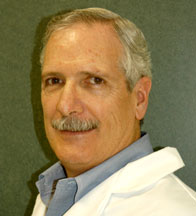 Dr. Griffing received his DDS (Doctor of Dental Surgery) at Unitec School of Dentistry in 1977. He is a respected member of the American Academy of Implant Dentistry, the American Dental Association, the California Dental Association, and the San Diego Dental Society. He is committed to excellence and regularly attends continuing education seminars to stay current in his specialty and to keep up with the latest techniques. Dr. Griffing also volunteers at St. Leo's Clinic in Solana Beach, CA addressing dental and health care issues for the poor and underinsured.